Water Filters – Frequently Asked Questions? Since 2001 Celtic Water Solutions has installed an maintained water treatment systems and filters for a wide range of customers. We have written this frequently asked questions blog post to aide you with your water filter questions. While this may be of benefit and answer some of the most common questions posed to us over the years, if you do not find an answer here we would encourage you to contact us with your questions so as we can provide you with a fully comprehensive answer. How often should I replace my water filter? One of the most common questions we hear in the office of Celtic Water Solutions is in relation to how often a water filter cartridges should be changed, whether it be a standard sediment or carbon filter, or reverse osmosis membrane, every customer has two key priorities in mind, How long will I have dependably clean, great tasting water, and how can I be certain that my filter is still removing the impurities that can impact on the flavour of my water and the health of my family? To ensure the filter continues to reduce contaminants, we recommend it be replaced every twelve months. What if I do not change my filter every twelve months? If you do not change the filter, while it may look clean it will become clogged, causing the water flow and the water pressure to drop, this in turn will make pumps work harder to try and boost the water pressure and flow which can then cause damage to the pumps and equipment. Also as a result of less flow and pressure the filter will no longer continue to filter the water correctly. The average size of the openings between pieces of the filter media are represented in microns. For example, a 20 micron filter has larger openings than a 5-micron filter, as a result the 20-micron filter will allow larger particles to pass through the filter than the 5-micron media would. A general rule of thumb is the smaller the micron rating, the better. How can I filter bad smells or taste from my water? As long as the actual cause is filtered before, as an example iron the water, which is removed with an iron filter can sometimes leave a bad taste or unpleasant smell. This can be removed using a carbon filter which is the same size as a sediment filter but instead of catching sediment it will treat the water and the carbon reacts with the foul odours and tastes. How can I remove chemicals from the water? 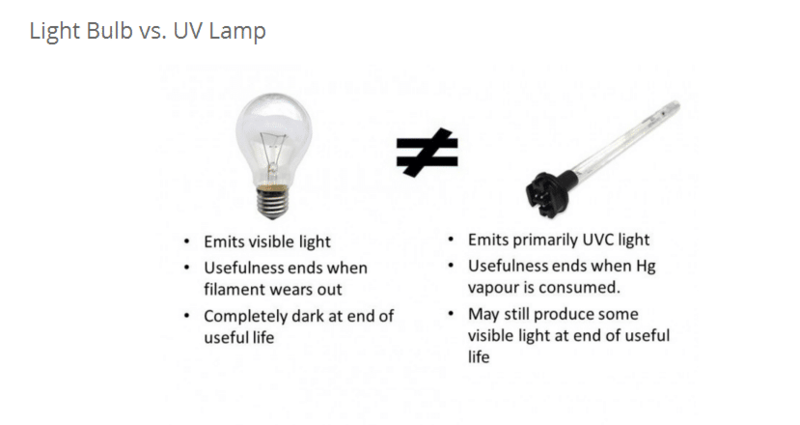 Why Must I Change My UV Bulb When it is Still Lit? A UV lamp is not an ordinary light bulb. One of the most misunderstood things about a UV water treatment system is why the lamp should be changed even though it still appears to be working. Why is it that the useful life is typically defined as 9,000 hours, or about one year of continual use? The problem arises from the fact that for most of us, our understanding is heavily influenced by our experience with incandescent lights. These are your garden variety bulbs, used in most household light fixtures, it is not necessary to change or replace this bulb until it quite literally burns out. An incandescent light bulb works by passing electricity through a tungsten filament. This generates heat that causes the tungsten to glow. That glow is the visible light spectrum, so we see the light. The tungsten filament is deteriorated with use and eventually it becomes so thin that it quite literally snaps, and no longer lights. A UV lamp, however, operates on a different principle, more like a fluorescent light. In this case, the electricity is still passed through a tungsten filament which heats up, but that energy “excites” the mercury vapor contained in the lamp. (Not to worry, only a very small amount of mercury is used, typically <10 mg, and it’s safely contained.) In this case, it is the mercury vapor that glows and, emits ultraviolet (UV) light. This is exactly what’s needed to inactivate any pathogens in your water supply. As you may know, UV light is not visible to the naked eye and is, in fact, quite damaging, so never look directly at a UV lamp while it’s on. If your system has a view port, you may see a blue glow from the lamp, but that’s not a result of the UV rays. Remember, UV light cannot be seen by the human eye. This glow is simply a by-product of the lamp’s operation. The useful life of the UV lamp is determined by the rate at which the mercury is consumed. That very small amount of mercury contained in the lamp will provide sufficient UV rays to disinfect the water for about one year. After that, although the lamp appears to be working, there is not enough UV produced to safely drink the water. Changing the lamp on time is critical to ensuring your safety. That’s why many UV systems have a timer that will count down from 365 days and then sound an alarm to let you know it’s time for a lamp change. Did you know drinking water at the correct time maximizes the effectiveness on the body? It’s common knowledge that drinking eight glasses of water a day is essential for the body to function properly, however, most people will tell you that they do not drink enough water. While we all know that hydration is key for good health, most are not aware that timing your consumption of water can be equally as important. Numerous scientific studies have shown that drinking water at certain times of the day can optimize the health benefits. Drink one glass of water after waking up to help activate your internal organs. Consuming water first thing in the morning helps flush circulating toxins out, prior to the first meal of the day. Unfortunately, many people reach for a cup of coffee in the morning before a glass of water. Because coffee is a diuretic, it encourages fluid loss, which is dehydrating and increases blood viscosity. Drink one glass of water 30 minutes before a meal to help digestion, as it prepares the stomach for food by stimulating digestive enzymes and bile production. Drinking water thirty minutes before each meal will also reduce your chances of overeating. Drink one glass of water before bedtime to replenish any fluid loss that can occur during the night. Experts don’t necessarily agree on how soon before bed, but most concur that drinking a glass before bed provides the body with water needed to aid in detoxification during sleep. Although some advocates suggest a glass right before bed, others advise having your last drink of water two hours prior to bed if going to the restroom at night is an issue. It’s no wonder that spa owners across the nation are turning toward filtered water systems. Many spa owners claim that regular tap water contains bacteria and minerals which can clog pores. Over time, this can mean dull skin. Experts say the cleaner the water, the better it can clean. Water filters help weed out things like and heavy metals. The cleaner, softer water, attributes to not only clearer, but also softer skin. Heavy hard water can irritate skin. But, while spa going is a luxurious way to spend the afternoon, it’s not practical for everyone’s wallet. With a filtered water system at home, cleansing the face in your own sink can have the same radiant effect on your skin. Soft water will also help skin problems such as eczema, by allowing your own natural oils to moisturise your skin. It will also help improve dry scalp conditions. The answer to weight loss is all around you. If you eat right and exercise at the intensity, frequency and duration appropriate for you, but still can’t lose those excess pounds, you’re probably just not drinking enough pure water. The metabolism of fat is actually something that the liver does when it converts stored fat to energy. Unfortunately, another of the liver’s duties is to pick up the slack for the kidneys, which need plenty of water to work properly. If the kidneys are water deprived, the liver has to do their work along with its own, lowering its total productivity, and your bodies ability to burn fat. Eight glasses is okay for the average person, but if you’re overweight, you should drink another glass for every 25 pounds of excess weight you carry. You should also up this if you live in a hot climate or exercise intensely. This water consumption should be spread out throughout the day. It’s not healthy at all to drink too much water at one time. Water makes up more than two thirds of the weight of the human body. The human brain is made up of 95%, and without it we would die in just a few days. The average person needs about 8 glasses of water per day. But that is just an average. Some people need more, and some less. A drop of as little as 1.5% – 2% in our body’s water supply can trigger signs of dehydration, headaches, loss of concentration, and can even be the cause of fatigue. By the time you feel thirsty your body fluids have already dipped. Drinking regular amounts of uncontaminated clean water will help your body & brain to function at it’s best. Ample pure water intake can help you fight off the common cold, it helps break up the mucus so that our body can remove it. Water can assist in controlling the body temperature, it distributes nutritional minerals, & lubricates the body. It helps muscle tone & flex-ability, removes waste products from the body, reduces water retention & nourishes dehydrated skin. With all this in mind a good tip is to start off the day with two glasses of clean water before you consume anything else. It’ll get a quarter of your daily requirement out of the way and help you start the day on a healthy note. The human body can survive 35 days without food, but only 5 days without water. Our bodies consist of up to 80% water – we require 8 glasses of water a day to remain well hydrated. This is supported by many doctors and nutritionists. Start off the day with two glasses of water before you consume anything else. It’ll get a quarter of your daily requirement and help you start the day on a healthy note. Don’t use thirst as a measure of whether to drink water or not. Our thirst mechanism lags behind so by the time you feel thirsty your body fluids have already dipped.